Cute pictures, but if you have a slow connection you may be waiting a while. Sorry... but I couldn't stop taking pictures yesterday! 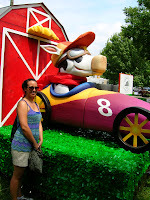 The SO and I went to the Indiana State Fair, a tradition that we must do each year. It was a typical hot and humid Indiana August day. Around 92F (33.3C), and with humidity it should have been worse, but thankfully, we had a breeze that would occasionally cool us down. The SO gets WICKED grouchy when hot, so I was hoping for a cooler day. 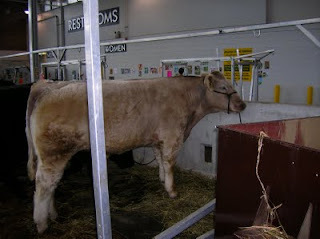 But we made do, visiting animals first thing in the day and then the indoor exhibition halls in the afternoon as it got warmer outside. 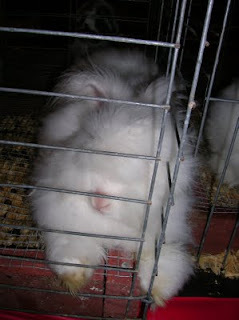 To start, we visited the bunnies (of course!). Poor little dudes must have been hot as many were flopped out trying to keep cool. It's funny because the SO never had a pet growing up and is not a big fan of pets. I, on the other hand, have always had pets (dogs and cats), and I'm crazy for animals (not quite Elmyra Duff, but almost). 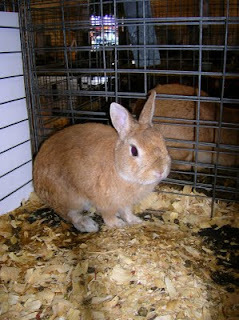 The SO is starting to know his rabbit breeds, he could pick out the Netherland Dwarfs from across the room. And he was pointing out all the cute buns and was all concerned about the well being of the rabbits, wondering if they had enough hay, water and air circulation. Dude has a soft side, just don't tell anyone. 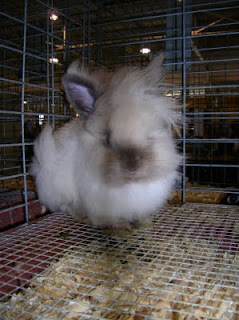 And the angora, jersey wool and lion head buns are adorable! I think the SO like the lion head... I would LOVE to get one someday (BTW, I can feel his glaring eyes as he reads that sentence, good thing he reads this while we're at work so he's across campus in another building!). and sheep! 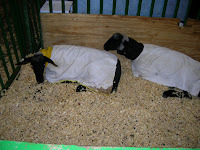 We saw the sheep in their frocks following a sheering. 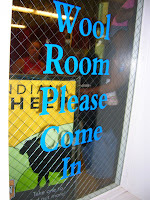 We were able to see some sheep get sheered (it took everything in me to not run over and grab the piles of wool and run). As if they had to put up a sign to ask me to enter! Dudes! But because they insisted that I must enter, enter I must. There is a lot of random stuff at the fair. 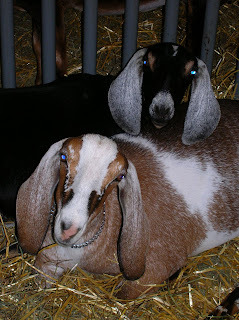 The SO and I typically bypass the Midway (we love roller coasters, but a little leery of these beasts at the fair). 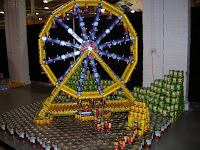 We also bypass the deep-fried goodness at the fair. Blasphemy, I know! 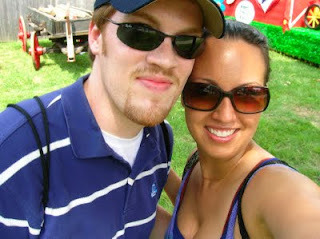 But I really don't care for fair food and the SO isn't a fan. Plus I had a bout of food poisoning this past week (FYI: don't eat a breakfast sandwich that was sitting on your desk for 4 hrs -- the next few days are horrible, if you know what I mean). But bypassing all of these outdoor things was probably a good thing because the temperature was rising and the SO needed the indoors! 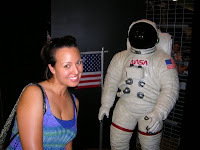 We visited Pioneer Village and saw some cool stuff. I didn't take pictures but we saw ladies spinning and weaving and dudes turning bowls and chiseling. I always think it's funny that there is such segregation in the genders on crafts. Did they REALLY segregate back then in pioneer times? I would think that whomever would do the chore if and item was needed. Like if a basket was needed would the dude of the family say "No way, I am going to go chisel this thing instead of making the needed basket." I'm sure historically there IS some gender differences in preference, but I really don't think it was a stark as what we make it out to be. 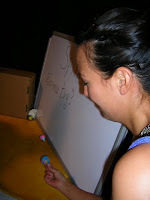 Maybe there was and I'm too naive on gender differences. The SO and I had a huge debate about this. I might look this stuff up sometime. But anyways, I found one lady demonstrating tatting, which I found particularly interesting. That's an intense craft, man it was cool! It is the year of the Tomato at the IN State Fair. I really don't know what that means other than there were a lot of Red Gold cans and signs everywhere. 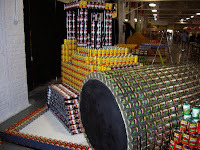 In one hall we saw these sculptures made from Red Gold veggie cans. Odd but kinda cool. 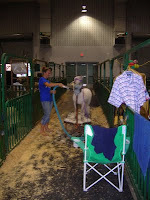 I went crazy in the petting barn. 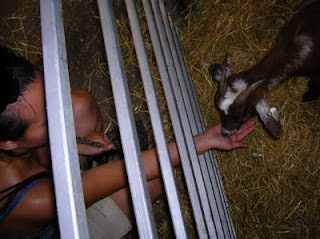 The pygmy goats were of course, my favorite. and next to this cow race driver, thing. The SO loves my obsession with photographing everything. Actually he gets wicked embarrassed and constantly picks on me saying my Asian mother inspired my obsession with pictures. But he's a good sport. What a good guy... awww! Last we visited the Fine Arts and Home Crafts Hall. 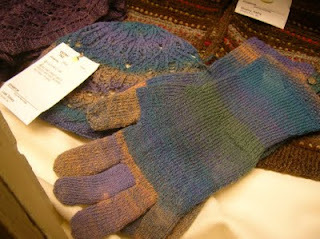 Here I leave you with some of the awesome handmades from other artists here in Indiana. 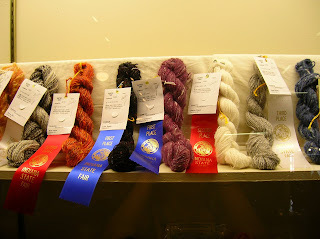 Here are some of the handspuns that placed first, second and third in their respective categories. 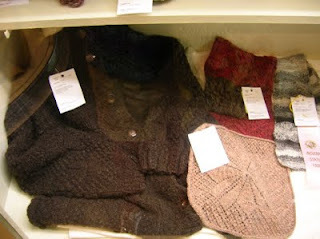 And they had some products made with handspun. I loved, loved, LOVED, this hat and glove set. Handspun. 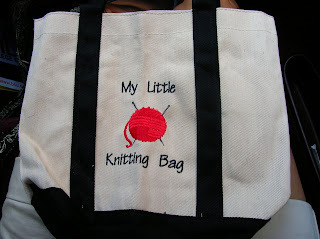 You can see the itty-bitty perfect stitches. And the color in this photo are pretty true to the color of the product. Handspun and dyed! Beautiful! 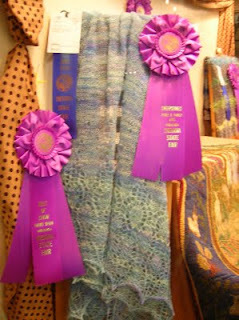 And here is the grand champion handspun and knitted. 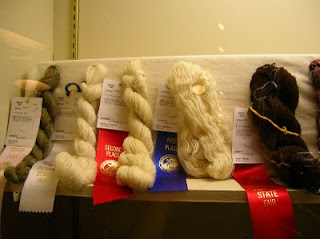 The picture of the grand prize handspun came out blurry, but believe me it was pretty. 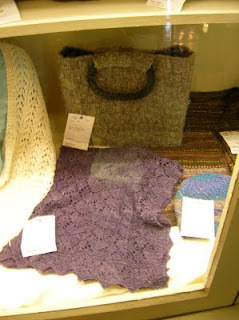 The shawl is spun, dyed and knitted by the same person that made the hat and glove set. Personally I liked the set better, the stitches were amazing! But this shawl is also pretty, I must give my respects. Just as an FYI, this wasn't the only thing we did yesterday. At midnight the SO took me out into the boonies and we watched the meteor shower! What a good guy! Overall I had a great day. I think the SO did as well. Meteor shower! That's right I almost forgot. I hope I can see it this week too. 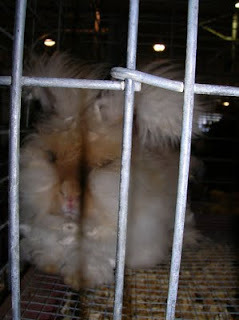 Now you have me wanting an angora bunny again. No no no. Must not get bunny. Too much poop. 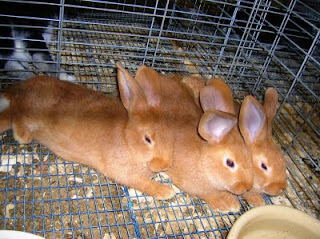 Those bunnies are a cuteness bonanza, right there. I thought I had a great trip. 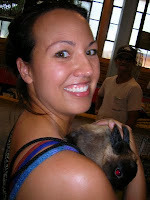 Love love all of the animals but those bunnies are so sweet! 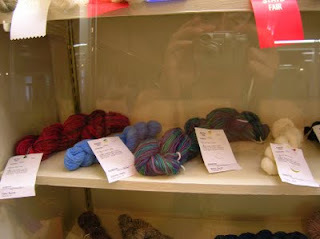 So how can you go to the shop and not walk out with yarn?